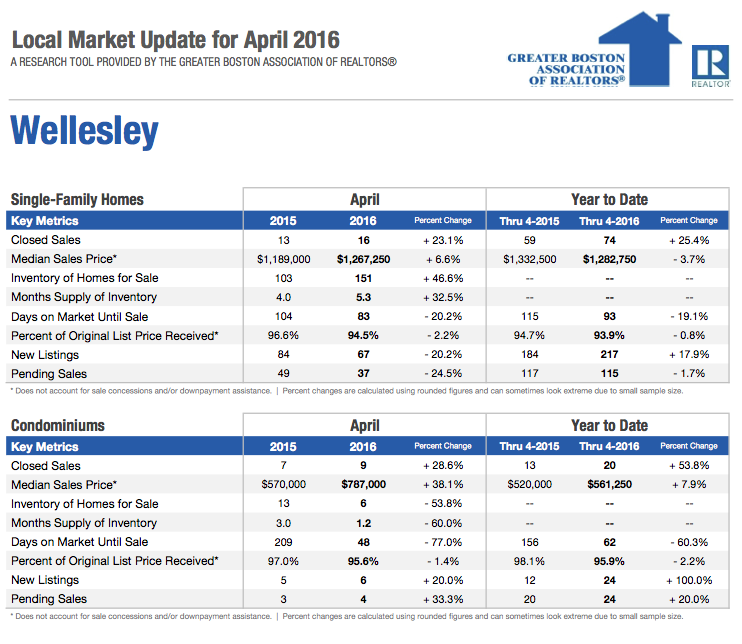 The Greater Boston Association of Realtors has released the local market updates for the first quarter of 2016 and aside from some high condominium pricing; the real estate market in Wellesley is not looking too bad! The supply of homes for sale in April was higher than March, indicating that people are now putting their homes on the market. While prices saw a small increase of 6 percent over last year, that did not affect sales negatively. On the contrary, closed sales for single-family homes saw an increase of 23 percent. Pricing for condominiums saw an increase of 38 percent from last year, leaving the median price of a condo at $787,000. That figure was significantly higher than March as well, suggesting that this might be an unusual increase and prices might be moderating soon. However, closed sales still saw an increase of 28 percent. Aside from the high pricing for condominiums, judging from sales, the market is looking healthy. Whether buying or selling in Wellesley, now is a good time!